Note: The Thursday sessions will not be taking place during August 2018 while we have our summer break. 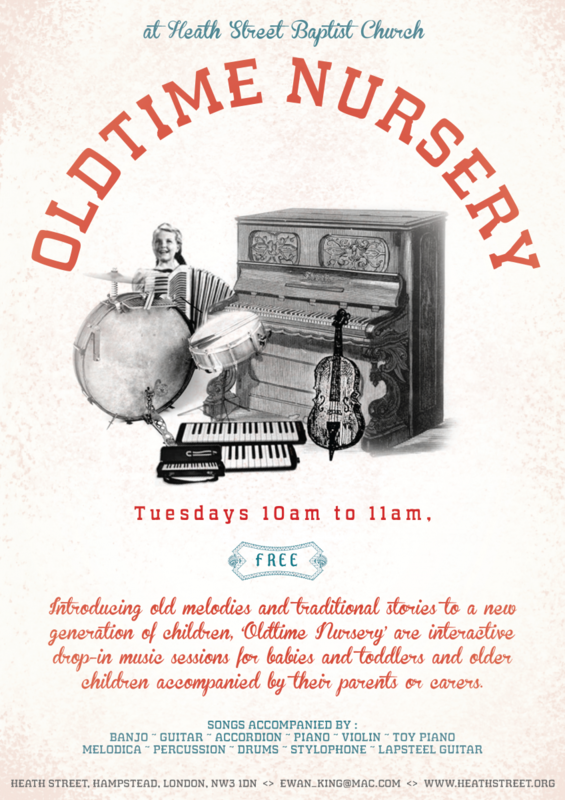 Introducing old melodies and traditional stories to a new generation of children, ‘Oldtime Nursery’ is an interactive drop-in music session for babies and toddlers and older children accompanied by their parents or carers. Songs accompanied by banjo, guitar, accordion, piano, violin, toy piano, melodica, percussion, drums, stylophone and lapsteel guitar. Held at Heath Street Baptist Church, Heath Street, Hampstead, London, NW3 1DN. See map and get directions. Sessions are held on Tuesdays and Thursdays - see below. Sign up to the Oldtime Nursery mailing list here. 10:00 - 11:00 am every Tuesday. 10:30 - 11:30 am every Thursday. John Baker on johnhenry@heathstreet.org or 07840 456593.